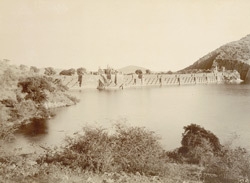 Photograph of the bund at the Udaisagar Lake from the 'Reading Collection: Views of Udaipur' taken by an unknown photographer c.1910. The photograph is part of an album containing architectural and topographical views of sites in Rajasthan, mainly of Udaipur, originally in the collection of Rufus Daniel Isaacs, Lord Reading, who served as Viceroy of India (1921-1926). Udaisagar Lake, an artificial lake lies 16 km east of Udaipur. Maharana Udai Singh (r.1537-1572) developed the embankment between 1559-1565. This is a view across the lake towards the massive bund or dam, which has tiers of pyramidal steps leading down to the water between buttresses and a temple on the top.